There is a nursery located in the Parish Hall to the right as you come through the doors and go into the Robinson Room. It is available for those with young children (ages 0-4) to use and is stocked with diapers and snacks, along with age appropriate toys and books. There are rocking chairs for adults and plenty of space to keep your young one engaged. Nursery is available during the 11:00 AM service during the fall/winter and also available during the 10 AM service in the summer. Audio is piped in from the service so you will not miss the homily and service if you need to take a break with your child! 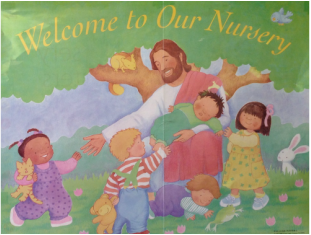 As our Parish expands and we have a greater need for a nursery attendant we hope to engage a nursery attendant for Sundays. If you would like to volunteer to be a nursery attendant during our busiest Sundays (Easter and Christmas especially please fill out the volunteer form and let us know your availability.